The English new wave and dance group ABC burst onto the scene in the early 1980s when their debut album The Lexicon of Love, produced by the in-demand Trevor Horn (dubbed ‘The Man Who Invented the Eighties’ on account of his impact on recorded culture in that era) went to Number One on the UK charts. A virtual greatest hits from the outset, The Lexicon of Love, contains the classic singles “Poison Arrow”, “Tears Are Not Enough”, “The Look of Love (Part One)” and “All of My Heart”, distinctive sounds that gave the scene a well-dressed and sophisticated allure. The group were as impeccably turned out as their music, which is often laden with soundtrack strings and soulfully multi-tracked vocals. ABC went from strength to strength with a string of grand albums including the underrated Beauty Stab, the witty How To Be A… Zillionaire! and Alphabet City. Combing elements of pure pop with neo-classical arrangements and latter elements of house, disco and techno ABC remained one of the definitive acts in that era, also masters of the 12” mix, but they were far from confined to the epoch and gave us further goodies in the shape of Up and Abracadabra. They are well represented here with the studio discs – often in augmented form – joined by live and compilation sets. 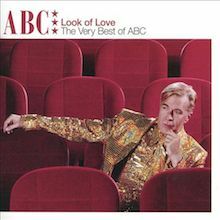 The ABC name has been kept alive by their front man Martin Fry, writer of so many brilliant songs in their repertoire, and ABC’s legend ensures that whenever they perform they retain not just their loyal fan base but also a new generation of listeners eager to discover their superbly polished and unique style of music. The first single, a funky synthpop extravaganza called “Tears Are Not Enough” was released ahead of the first album in October 1981 and headed for the Top 20. It also made inroads into the underground dance movement thanks to a 12” version released by Neutron/Phonogram that stretched out the A-side, and the flip, “Alphabet Soup”, giving them a cachet as well as prime time TV exposure. With the newcomer David Palmer on drums and Mark Lickley providing bass, ABC captured the moment. Trevor Horn, engineer Gary Langan and orchestrating genius Anne Dudley also had a surprise up their sleeve in the guise of JJ Jeczalik whose Fairlight CMI programming added another vital ingredient. The group were delighted with this arrangement and were keen to stretch out, utilising Singleton’s saxes and White’s keyboards and guitars with assists from Kim Wear on trumpet, Gaynor Sadler on harp, Luis Jardim on percussion and Andy Gray the trombone. Already revealing a perfectionist nature ABC were more than happy to include guest female vocalists Tessa Webb (on “Date Stamp”) and Karen Clayton; her speaking voice part on “Poison Arrow” is essential to the mood. Lush and often experimental The Lexicon of Love threw up so many good things. “The Look of Love” became their biggest UK chart hit and broke them in America when it made #1 on the Billboard dance/Disco chart, an incredible achievement given the calibre of dance music bubbling around then. Ever savvy and with a weather eye on the zeitgeist ABC also specialised in provocative promotional videos and ABC would be worth discovering for the debut disc alone. The ten-track original has since been pleasingly expanded. Remastered in 1996 with re-mixes, live and demo material, in 2004 it received a total makeover – here you get the original disc plus the singles, the 1981 Phonogram demos and a Live show from Hammersmith Odeon (November 1982), the whole thing beautifully packaged. The Lexicon experience, though wildly successful, was also a drain on resources, financial and physical. 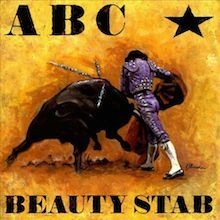 For Beauty Stab (1983) ABC retained much of their stylised approach but added a gustier guitar/bass/drums backing with Roxy Music sidemen Andy Newmark and Alan Spenner bringing a more muscular feel to the sessions. Bands often make their more interesting music at a time when they could easily rest-up and thanks to tracks like “By Default by Design” and “The Power of Persuasion” Beauty Stab adheres to that rule. Romance and glossy electro funk are all over the third disc, How To Be A… Zillionaire! (1985). Although Singleton had made his departure incoming friend Fiona Russell-Powell (aka Eden) brought her fashion sense and vocal styling to the party as well as her journalistic nous (she worked for The Face at the time) and since she had been involved in Vice Versa just before Fry’s arrival her character enriched the set-up. ABC configured in a different format now with guest guitarists and Chris Whitten on drums. White moved towards the synthesisers and co-production. Overall this is another deeply satisfying disc that contains the international hits “(How To Be A) Millionaire” and “Be Near Me”, another assault on the American pop and dance charts. Released with extra bonus tracks on the CD and greatly expanded on the 2005 version, this is as good as it gets in the mid-80s and remains a firm fan favourite. In 1987 ABC re-emerge with producer Bernard Edwards for the fine Alphabet City, a disc that casts an eye towards New York City. The standout track “When Smokey Sings”, a tribute to Smokey Robinson and the Miracles will become one of their best-loved singles. Now fronted solely by Fry and White again there is no shortage of classy guests. Richard Niles provides the string arrangement for “Smokey” and “The Night You Murdered Love”, Danny Thompson plays double bass, Judd Lander the harmonica and Howie Casey the sax, with other friends also paying a visit. Edwards’s production acumen helps make this classic and there are several songs that require re-examination: notably “Minneapolis” and “Chicago” on the 2005 remastered version. The dance mix of “King Without a Crown” kept ABC at the forefront in America. In 1989 ABC offered their take on house music with Up where Fry and White bossed the main sound with assists from Blaze, Julian Mendelsohn and Sonic Bob Kraushaar. The singles “One Better World” and “The Real Thing” were written with the prevailing ecstatic culture in mind but “North” and “The Greatest Love of All” are also typically lush, late-night ABC. Nor should Skyscraping and The Lexicon of Live be forgotten. Look of Love – The Very Best of ABC (2001) adds two new Fry songs, “Peace and Tranquillity” and “Blame”. The expanded version of this is Gold (2004) a 2-CD set with extra mixes. In more recent years the excellent 2008 disc Traffic returns ABC to their familiar hunting ground with some of Fry’s finest writing and drummer David Palmer back in the fold alongside producer Gary Langan. Incredible as it seems it’s now well over thirty years since this idiosyncratic group first entered our consciousness. Thanks to the retro and regeneration movement they will always have a place in the hearts of the devoted but there’s every chance that new material will surface soon. Given that they began with the desire to emulate such heroes as David Bowie and Roxy Music it is entirely to the credit of Martin Fry and his ABC cohorts that they are viewed as a classic act in their own right. So there you have them: made in Sheffield and sold all over the world. ABC's debut album combined the talents of the Sheffield, U.K.-based band, particularly lead singer Martin Fry, a fashion plate of a frontman with a Bryan Ferry fixation, and the inventive production style of former Buggles member Trevor Horn and his team of musicians, several of whom would go on to form the Art of Noise. Horn created dense tracks that merged synthesizer sounds, prominent beats, and swaths of strings and horns, their orchestrations courtesy of Anne Dudley, who would follow her work with the Art of Noise by becoming a prominent film composer, and who here underscored Fry's stylized romantic lyrics and dramatic, if affected, singing. The production style was dense and noisy, but frequently beautiful, and the group's emotional songs gave it a depth and coherence later Horn works, such as those of Yes ("Owner of a Lonely Heart") and Frankie Goes to Hollywood, would lack. (You can hear Horn trying out the latter band's style in "Date Stamp.") Fry and company used the sound to create moving dancefloor epics like "Many Happy Returns," which, like most of the album's tracks, deserved to be a hit single. (In the U.K., four were: "Tears Are Not Enough," "Poison Arrow," "The Look of Love," and "All of My Heart," the last three making the Top Ten; in the U.S., "The Look of Love" and "Poison Arrow" charted Top 40.) ABC, which began fragmenting almost immediately, never equaled its gold-selling first LP commercially or artistically, despite some worthy later songs. The difference between Beauty Stab's chart statistics in the U.K. and in the U.S. is extremely contrasting. 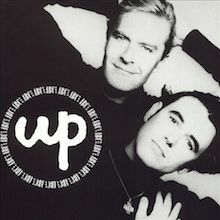 The album's only single, "That Was Then and This Is Now," reached number 18 in the U.K., while it stalled at number 89 in the United States. The album itself climbed to number 12 on ABC's side of the ocean, while it stalled at number 69 on the American charts. The reason that Beauty Stab made such a substantial impact in the U.K. was due mainly to the album's makeshift concept about the band's take on modern England, with Martin Fry and Mark White trying to push their opinions through the buzz of guitars rather than the shiny pop sparkle of synthesizers and drum machines. Every aspect that made Lexicon of Love a masterpiece is absent on Beauty Stab. Gone is the brilliant songwriting which involved Fry's clever wordplay and acute wit, the pre-fabricated hooks that are so addictive, and, above all, the squeaky-clean sound from both a production standpoint and an instrumental one is nowhere to be found. ABC tried to implement a slightly hardened sound into their music, but the result came out thin and undistinguished. The single was the only redeeming factor, showing the most pizzazz of any of the other cuts. "Bite the Hand," "Unzip," and "S.O.S." contain small amounts of pop delight, while "Love's a Dangerous Language" and "Power of Persuasion" tried to recapture Lexicon's spirit, but they both came up short. Album sales for Beauty Stab faltered, since fans were expecting a Lexicon of Love part two, but were utterly disappointed. The change for ABC seemed to be rushed, and the band should have echoed the same characteristics into Beauty Stab since the high demand for their brand of lustrous was still alive and well. Only Fry and White remained for 1985's How to Be A...Zillionaire!, with a handful of session musicians hired to play on the album. 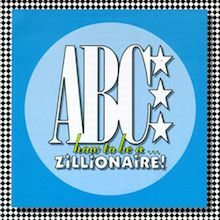 Moving away from the guitar histrionics of Beauty Stab, Martin Fry reduced ABC to a duo of himself and Mark White for 1985's danceable How to Be a...Zillionaire! Incorporating light hip-hop rhythms, ABC made sure Zillionaire sounded contemporary for mid-'80s dance clubs, and as a result, some of the record sounds stiff and dated. Still, when Fry's sense of melody is on, as on the catchy single "Be Near Me," or when he works in his vicious, cynical wit, as on "How to Be a Millionaire" and "So Hip It Hurts," the record rivals the peaks of Lexicon of Love. 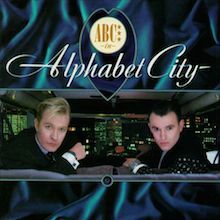 Returning to the Motown and Northern soul that provided the basis of their debut album, ABC turned to the pop songcraft on their fifth album, Alphabet City. The increased songcraft is certainly engaging, particularly on the hit "When Smokey Sings," but the songs are usually indistinguishable from each other, resulting in a sleek, stylish, and thoroughly entertaining album that leaves no lasting memory. ABC's formula started to sound tired on their fifth album, which completed their contract with PolyGram, and unlike their first four, missed the charts in the U.S., while managing only one week on the U.K. charts. The singles "One Better World" and "The Real Thing" were likewise only minor hits in England and nonentities in America. With a deeper and broader track listing than most ABC compilations, Look of Love: The Very Best of ABC more or less lives up to its name. Concentrating on the band's glory days, the album covers the highlights of ABC's first five albums, including de rigeur hits like the title track, "Poison Arrow," "When Smokey Sings," "Be Near Me," and "How to Be a Millionaire," as well as album tracks like "S.O.S.," "All of My Heart," and "The Night You Murdered Love." While some of the later inclusions, such as "The Real Thing," don't quite pack the punch of ABC's prime work, the 2001 track "Peace and Tranquility" fits in with the earlier material surprisingly well. Likewise, the somewhat random track listing might be somewhat annoying to anyone trying to track ABC's chronological development, but it does spotlight how consistent their brand of suave synth pop is. With a new song, a more diverse track listing, and no unnecessary remixes, Look of Love has a slight edge over Absolutely ABC: The Best of ABC as the group's definitive retrospective.